Imagine you are a police detective trying to identify a suspect wearing a trench coat, baggy pants and a baseball cap pulled low. Or imagine you are a fashion industry executive who wants to market virtual clothing that customers of all shapes and sizes can try online before they purchase. The main obstacle to these and other pursuits is creating a realistic, 3-D body shape — especially when the figure is clothed or obscured. "If you see a person wearing clothing, can the computer figure out what they look like underneath?" asked Michael Black, professor of the computer science at Brown. Black and graduate student Alexandru Balan believe they have figured out how that can be done. The researchers have created a computer program that can accurately map the human body's shape from digital images or video. 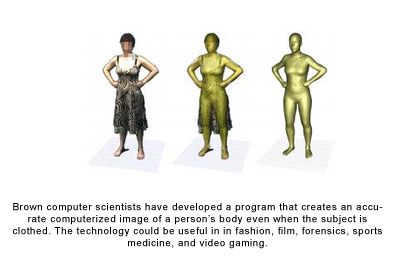 This is an advance from current body scanning technology, which requires people to stand still without clothing in order to produce a 3-D model of the body.